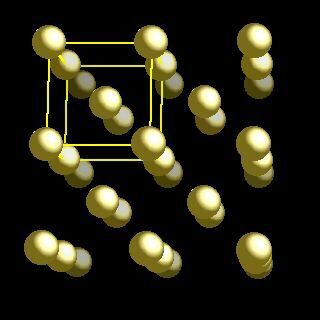 Sodium crystal structure image (ball and stick style). Sodium crystal structure image (space filling style). The body-centred cubic (bcc) structure is the most stable form for sodium metal at 298 K (25°C). Under normal conditions, all of the Group 1 (alakali metals) elements are based upon the bcc structure. The closest Na-Na separation is 372 pm implying a sodium metallic radius of 186 pm. This means that lithium is smaller than potassium. 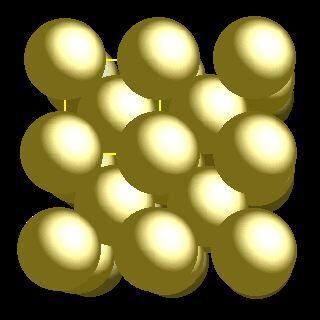 In the bcc lattice, every sodium atom is surrounded by eight other nearest neightbour sodium atoms organised into a cubic array. One way to visualize the bcc lattice is as two interlocked infinite cubic arrays of atoms. E. Aruja and H. Perlitz, Z. Kristallogr. Kristallgeom. Kristallphys. Kristallchem., 1939, 100, 195.